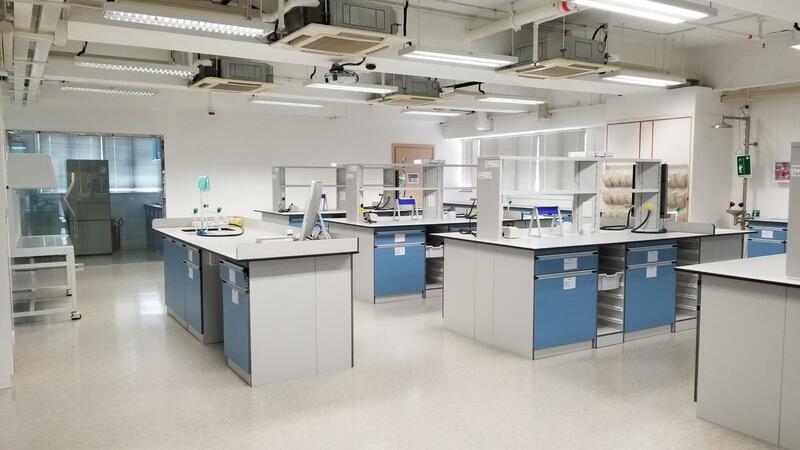 In order to respond to the new educational development trend, our school spent about HK$2,500,000 to establish a biotechnology laboratory to facilitate experiments in genetically modified food, DNA fingerprinting and microbiology, and cultivate students' interest in biotechnology, and promote STEM education. The laboratory is about 1228 square feet. It can accommodate up to 36 students for experiments. It is expected to require about $40,000 to $ 500,000 per year to maintain operations. We would like to express our sincere gratitude to Dr. Tong Nai Kan for his generous donation of HK$3,800,000 to make our vision a reality. The laboratory has set up higher-standard laboratory equipment such as thermal cycler, autoclave, laminar flow cabinet, etc. to increase students' chances of participating in fingerprint identification and genetic modification related experiments. Students can find 'murderers' through DNA fingerprint experiments. There are equipment and apparatus for students to do microorganism related experiments. Students will be able to identify whether foods have been genetically modified, or even identify their food genes combination. The school's biotechnology curriculum mainly refers to the guidelines framework of the subject of the Education Bureau, and then prepares the school-based curriculum and teaching materials ranging from microbiology to genetically modified food arguments and ethics. Prof. Y.H. Wong, Chair Professor and Associate Head of Division of Life Science, Director of Biotechnology Research Institute, The Hong Kong University of Science and Technology (HKUST) has mentioned that the development of biotechnology courses has a large capital investment. Many schools have not set up this course, which makes the students have difficulties and limit to learn the knowledge of Biotechnology. Therefore, our school successfully invited him as the chief consultant of the course to guide us to design our science curriculum. Students with outstanding performance in the future will have the opportunity to participate in the precision experiment at HKUST and are expected to publish their results in research journals. Last year, six teachers from the science department of our school attended a biotechnology experiment training in the Open University of Hong Kong. Our school is also applying for Quality Education Fund and we are looking forward to integrating information technology with biotechnology education. In the future, students will use the iPad to collect and analyze experimental data and use the AR (Augmented Reality) element to promote biotechnology education. In order to make full use of the facilities, students who have mastered the experimental skills will be trained as tutor in the future, and they will help pass the knowledge to the primary school students. We aim at nurturing our students continue to assist those who are determined to make biotechnology a long-term development goal and have the opportunity to enter the field of life sciences.